Are your libido, strength and endurance waning? Do you feel tired and listless? It may be low testosterone. 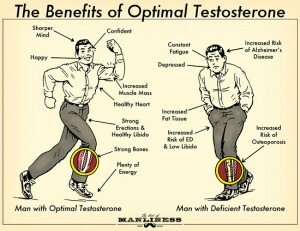 Hormone replacement therapy with bioidentical testosterone can restore your mood, mojo and motivation. Most men can’t articulate how they are feeling and complain of losing their edge. In a competitive fast paced work environment they can’t afford to perform under par. Natural bioidentical hormone therapy with testosterone given through the skin is an easy way to get back on track. Injections cause surges and plunges resulting in mood swings. Giving testosterone through the skin is more convenient. Levels stay stable and it may also improve erections as well as libido. Taking testosterone through the skin bypasses the liver and can reduce the side effects of abnormal liver function and production of binding proteins that make testosterone unavailable. There are many other benefits of taking bioidentical hormones. Having optimal testosterone levels can have a positive effect on the heart, bones, muscles, and brain and enhance energy, self esteem and confidence. There have not been any studies showing that testosterone causes cancer. Being monitored by a physician with experience in bioidentical hormone replacement therapy is essential to determine if you are converting testosterone to unwanted metabolites. Something often overlooked in conventional medicine. I study the studies so you don’t have to. Schedule a consultation or coaching session for more information. I want to help you function at your peak and look and feel your best.